I'd love some help with a tricky garden space at our new home. The previous owner was an avid gardener (this patch is just one of many) who grew roses, shrubs and flowers but didn't do any upkeep, apparently for the last 5 years or so. We're left with some unsightly dirt patches with some sparse shrubs and annuals with lots of vacant space that fills in with an abundance of weeds each spring and summer. 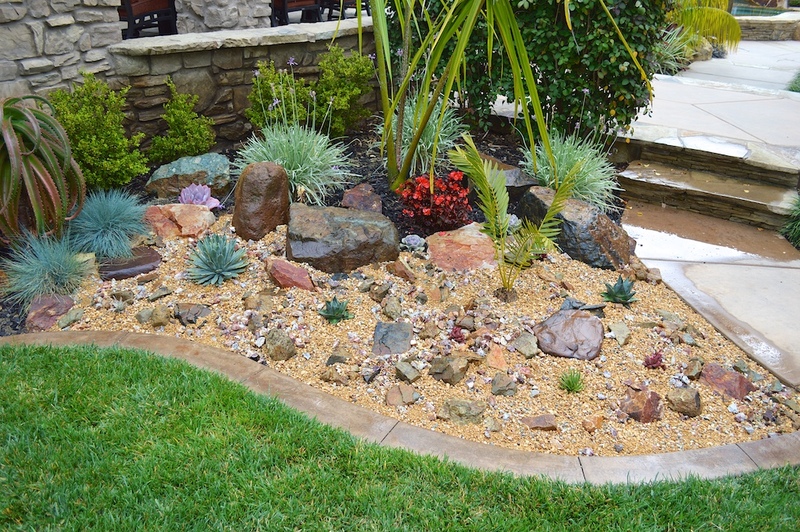 We're looking for some options to fill in the space in a cost-effective and visually appealing way, whether that's through greenery, a rock garden, some sod, or a combination. Our preference is towards a natural species garden as opposed to an overly manicured look. Gets a fair amount of wind/exposure to elements as this side of the property faces an open field. Any and all ideas would be very welcomed! We're beginner gardeners and don't even know where to begin. (Also, please forgive the rough-looking garage/eave situation - it's coming down!). Interesting challenge! I discovered that Canadian Hardiness zones are different than US ones. In the US system, the higher the zone number, the warmer the climate. In the Canadian system its the opposite, the higher the number the colder the climate. So your zone 3 actually corresponds about to USDA hardiness zone 8, so less cold than me down here in Georgia! (But probably not nearly as hot in summer, the zones are only about how cold it gets in winter.) I always forget how warm it can be that far north if you are near a warm ocean current! But it depends on the boulders. And it is a ton of work, because the boulders don't look right unless they are well dug in. I wouldn't do sod, because that little sloped strip would be a pain in the neck to mow. So that leaves shrubs and ground covers. I applaud your desire to use native plants. That is better for you, since they will be hardier and lower maintenance and better for the environment. 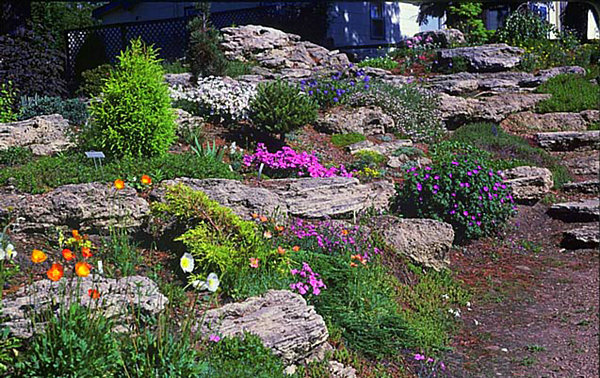 So maybe some low growing shrubs along with a couple taller things, filled in with perennials and ground cover to hold your slope. I think wild strawberry is kind of a pretty native ground cover. Bearberry (kinnikinnik) is a is a low growing, spreading shrub, that only gets about a foot tall. It is evergreen, which would be very nice for what you want. It is a little slow to establish in the first year or so, but then will spread well and be exceptionally hardy and low maintenance. Juniper is also native for you and has prostrate, spreading forms. An alpine garden would be perfect there. I'm not familiar with your native plants or their availability. I'm also not sure if you have local organizations like our Soil and Water Conservation agency but if you have something like that or any local conservation agency they might be able to help you locate plants and give you tips about setting up an alpine garden. Hopefully you can find some place that can deliver large rocks without it costing a fortune. shade loving and drought resistant?? ?